Successfully Added SCISHION V88 PRO TV Box - Android 6.0, 4K Resolution, 3D Movie Support, Quad-Core CPU, Google Play, KODI 16.1, Wi-Fi to your Shopping Cart. Turn your regular flat screen TV into an Android 6.0 Smart TV with the SCISHION V88 PRO TV Box. An Android 6.0 operating system, Google Play, KODI TV, 4K resolution, and 3D movie support – this Android TV box has all the means to turn your living room into a first class media center, guaranteeing a top-notch entertainment experience. Its Android 6.0 Operating system and Wi-Fi connectivity allow you to take the most out of this magnificent Android TV Box. 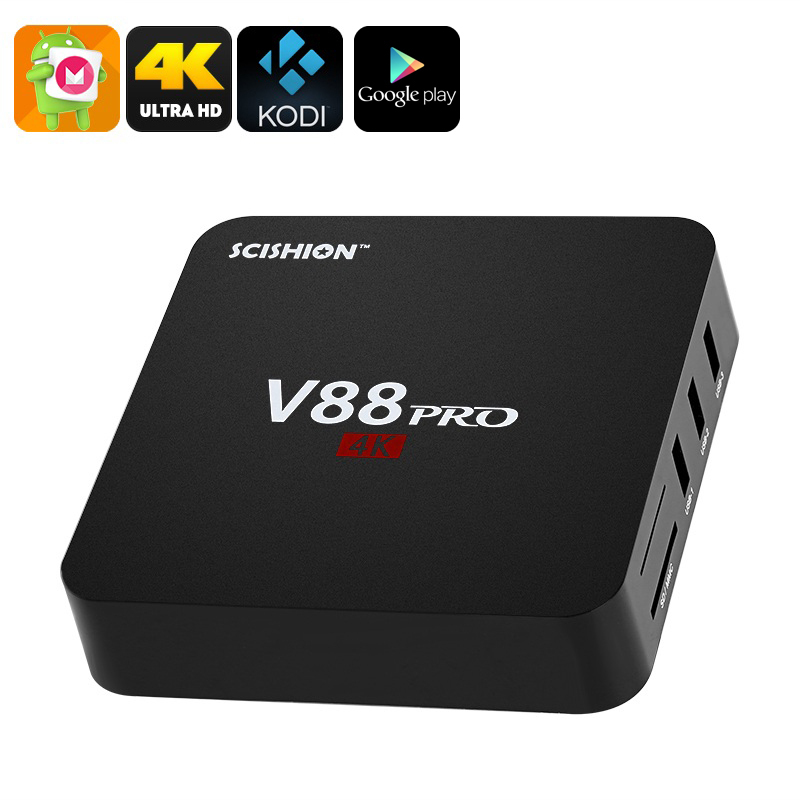 Enjoy a comprehensive range of media available through the KODI media player, or download millions of Apps, games, and media in the Google Play store – the SCISHION V88 PRO TV Box is guaranteed to bring along a timeless amount of fun. Featuring a Quad-Core CPU that has been clocked at 2.0GHz, 1GB of RAM, and a Mali-450 GPU this Android TV box is capable of playing the latest and most demanding games and movies in 4K resolution without dropping a single frame. Along with its 3D movie support, this Android entertainment system offers a truly cinematic experience and the means to turn any living room into your own personal movie theater. With its Wi-Fi connectivity, the SCISHION V88 PRO TV Box turns your regular TV into a powerful computer. Browse the web, download games, enjoy apps such as YouTube, Netflix and Hula, or stay in touch with your friends and relatives through social media – with this android TV box your possibilities are limitless. Easy to set up the SCISHION V88 PRO TV Box has a modest 8GB of memory that can be extended thanks to its 16GB SD card support and USB memory options. With this Android entertainment system, there is no fear to run out of storage space anytime soon. Being the perfect device to enjoy a truly cinematic experience from the comfort of your own living room – this Android 6.0 TV box a perfect asset to every modern household. The SCISHION V88 PRO TV Box comes with a 12 months warranty, brought to you by the leader in electronic devices as well as wholesale Android TV Boxes..
Arabic: - الروبوت وأي فأي 6.0 التلفزيون مربع - Chinese Simplified: - 安卓6.0 WiFi 电视盒 - Czech: - Android 6.0 WiFi TV BOX - Danish: - Android 6.0 WiFi TV boks - Dutch: - Android 6.0 WiFi TV BOX - French: - 6.0 WiFi Android TV BOX - German: - Android 6.0 WiFi-TV-BOX - Hebrew: - תיבת טלוויזיה 6.0 WiFi אנדרואיד - Hindi: - एंड्रॉयड 6.0 वाईफ़ाई टी वी बॉक्स - Italian: - Android WiFi 5,1 TV BOX - Japanese: - アンドロイド 6.0 WiFi テレビ ボックス - Korean: - 안 드 로이드 6.0 WiFi TV 상자 - Malay: - PETI TV 6.0 WiFi Android - Norwegian Bokmål: - Android 6.0 WiFi TV boks - Romanian: - Android 6.0 WiFi TV BOX - Russian: - Андроид 6.0 WiFi TV BOX - Spanish: - 6.0 WiFi Android TV BOX - Thai: - กล่องทีวี 6.0 WiFi - Turkish: - Android 6.0 WiFi TV kutusu - Vietnamese: - 6.0 WiFi Android TV BOX.